Blow molding is the process of inflating a hot, hollow, thermoplastic preform or parison inside a closed mold, so its shape conforms to that of the mold cavity. A wide variety of blow molded hollow parts, including plastic bottles, can be produced from many different plastics using this process. This blow molding process involves the production of hollow objects, such as bottles, having biaxial molecular orientation. Biaxial orientation provides enhanced physical properties, clarity, and gas barrier properties, which are all important in products such as bottles for carbonated beverages. There are two distinct stretch blow molding techniques. In the one-stage process, preforms are injection molded, conditioned to the proper temperature, and blown into containers—all in one continuous process. This technique is most effective in specialty applications, such as wide-mouthed jars, where very high production rates are not a requirement. 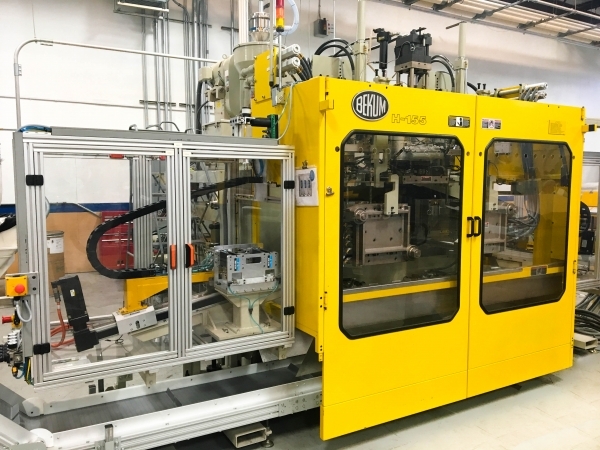 In the two-stage process, preforms are injection molded, stored for a short period of time (typically 1 to 4 days), and blown into containers using a reheat-blow (RHB) machine. Because of the relatively high cost of molding and RHB equipment, this is the best technique for producing high volume items such as carbonated beverage bottles. Within the injection blow molding process, the material is injection molded. The hot material, still on the core pin, is then indexed to the blow molding station where it is blown into a bottle and allowed to cool. The bottle is then indexed to the next station and ejected. Injection blow molding allows more precise detail in the neck and finish (threaded) area than extrusion blow molding. Little improvement in physical properties is realized in the injection blow molding process since very little orientation occurs. The extrusion blow molding process begins with the conservative extrusion of a parison or tube, using a die like those used for making plastic pipe. The parison is then extruded downward between the two halves of an open blow mold. When the parison reaches the proper length, the mold closes, catching and holding the neck end open and pinching the bottom end closed. A rod-like blow pin is inserted into the neck end of the hot parison to simultaneously form the threaded opening and to inflate the parison inside the mold cavity. After the bottle cools, the mold opens to eject the bottle. The excess plastic is trimmed from the neck and bottom pinch-off areas. Injection molding and blow molding are the two most popular ways to produce high quality, cost-effective plastic parts and products, however they have differences. The most noticeable difference between parts made by injection molding and parts made by blow molding is that injection molding creates solid parts, while blow molding creates hollow parts. If you’re producing something that needs one rigid wall, injection molding may be what you’re looking for. Some common examples of parts created with injection molding are bottle caps, hair combs, and housings for computers and televisions. Conversely, if you are looking for a product that is flexible, operational, and can hold a fluid, like a bottle or a cooler then blow molding is what you need. Contact us for more information regarding our injection blow molding capabilities for creating blow molded parts, or request a quote today.